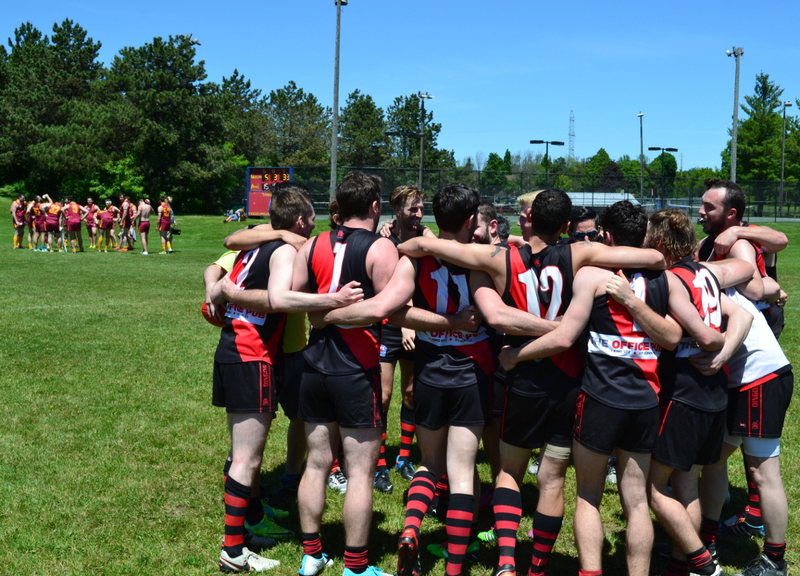 After a delayed start to their season due to the wet conditions last week, the Toronto Dingos were keen to kick things off when they travelled to Guelph to take on the Grand River Gargoyles. After such an auspicious start to the AFL Ontario season, the conditions at Margaret Greene Park couldn’t have been better, with not a cloud in the sky and a dry ground underfoot. The lads were also keen to get a win for their new coach Mike Karas and captain Mike Bocian who pushed the team hard throughout the pre-season. The Dingos got off to a quick start, kicking two goals out of the gate including one to Irish rookie Ricky Nolan. Much of the hard work was done in the midfield, as the rovers worked with ruckman Tom Bell to win the pill and deliver it forward with clean, quick kicks. While the Gargoyles evened up the play and eventually responded with two of their own, the Dingos finished the opening term with a 4-2-26 to 2-0-12 advantage. Captain Mike Bocian, the rock of the Dingos’ backline, had to leave the field briefly due to the blood rule but was ably patched up at quarter time and able to return and play out the remainder of the game. In the second quarter the Dingos really asserted their control over the midfield and ultimately through the hard nosed play of returned Australian players Steve Speers, Justin Davis, and Dan “The Rifleman” Gunn. The Dingos adding another four majors while allowing only one at the other end before the horn for half-time sounded, with the Dingos sitting in a strong position up 8-4-52 to 3-0-18. Through a lot of hard play, Grand River must have felt the chance of a comeback in the wind, as they got significantly more ball early in the third quarter than they had seen throughout the first half. However, the Dingo backline held firm, with some gutsy clearances by Greg Gilbert and Stephen Donnelly, and the Gargs struggled to convert adding just one goal and three behinds for the quarter. The Dingos rallied and added two majors of their own to keep the scoreboard ticking over. In the final term the Dingos came out re-energized and made sure the result was in no way in doubt, playing the majority of the football where they wanted it and adding 5 additional majors and 5 behinds to their tally. Steven Speers who led by example directing traffic in the midfield all day secured best on ground honours. Geoff Hansen and Thomas Santibanez-Espinosa were outstanding in the forward line, ultimately kicking nine between them, and were ably assisted by Ricky Nolan in the half forward line who completed the rookie hat trick. The two other Dingos rookies making their debut, Lynden Evers and Mike Mcmurrich, accounted well for themselves, with Lynden also picking up a goal for his trouble. After wrapping things up in Guelph, the team headed back down the 401 and to our downtown sponsors The Office Pub on John Street for a well earned night out for the annual rookie night celebration. The Dingos will be looking to build on their solid start to the season when they take on the Broadview Hawks in their AFL Ontario Round 3 clash at Humber South on June 10th.